In 1948, a combat veteran named Earl Schaffer set out to “walk off the war” and hiked the entire Appalachian Trail (from Georgia to Maine), becoming the first thru-hiker on record. Since then, hundreds of combat veterans (recently aided by the Warrior Hike “Walk off the War” Program) have hit the trail as they try to decompress from their wartime experiences and come to terms with civilian life. For many, one of the things they struggle with is post-traumatic stress syndrome (PTSD), which effects at least 7.7 million American Adults, 31% of Vietnam Vets, and 20% of Vets from the Wars in Iraq and Afghanistan. On October 4, 2013, I celebrated the completion of my Appalachian Trail thru-hike with my fellow thru-hikers and trail family. Zach “Shady” Adamson, a fellow thru-hiker and a United States Iraqi Freedom and Operation Enduring Freedom War Veteran was one of the friends celebrating with me. It had become apparent to me as we hiked together that Shady had left the war, but that the war hadn’t left him. Like many combat veterans I’ve known, Shady didn’t sleep well, had vivid flashbacks (more back story here), and seemed to be suffering from PTSD. I saw that he was struggling, and I tried to help but I didn’t really know how. I hoped that maybe my dad, a Vietnam combat vet, would know how to help, but I didn’t get the chance to introduce them to each other. 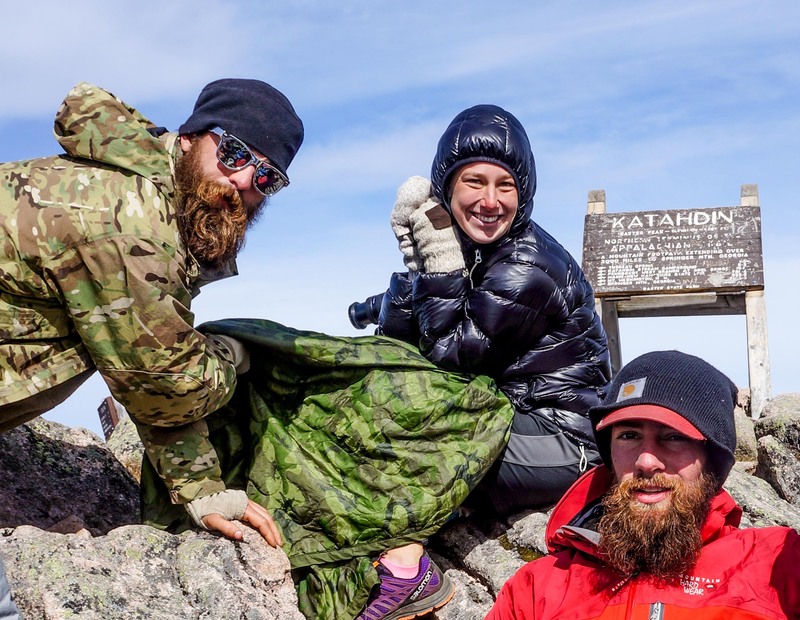 That afternoon as we parted ways at the summit of Katahdin none of those struggles were evident. He was on top of the world, full of hugs and smiles, and celebrating just as much (if not more) than the rest of us. On January 9, 2014, just 3 months after completing his thru-hike of the Appalachian Trail and less than a year after completing his military service, Zach “Shady” Adamson committed suicide (his obituary). The hearts of all of the people that he had even known collectively broke. We learned in the harshest possible way that sometimes it takes more than walking 2200 miles to “walk off the war.” As I struggled to wrap my head around Shady’s suicide, I learned that 22 veterans a day commit suicide and “the number of male veterans under the age of 30 who commit suicide jumped by 44 percent between 2009 and 2011.” Holy sh**! Shells of who they used to be. Our silence is our shame. carrying burdens we cannot see. It shouldn’t be their doom. I have never felt a greater sense of community and belonging than I did on my solo thru-hike of the Appalachian Trail. I spent most of my time alone, but whenever I encountered another thru-hiker there was an immediate spark of recognition and a connection. A recognition that whatever we were or did before, we were now thru-hikers. We’d trudged through the rain, scrambled over rocks, dodged rattlesnakes, sworn at mice, seen amazing views, met incredible people, and accepted both food and kindness from complete strangers. We’d been hot, we’d been hungry, we’d been thirsty, we’d hurt, and through it all, we’d persevered, because we were thru-hikers. It didn’t matter if we’d known each other for 30 seconds or 6 months, we were a community and we looked out for each other. There are some people on the trail that you connect to so strongly that they become more than just your community and your friends, they become your crew, your trail family. For most of my hike I was a loner. I rarely saw the same people more than once. I was part of the community, but didn’t have a trail family. Somewhere in Maine I realized that that had changed, I was part of a crew and had been adopted into a trail family. I still hiked by myself, but my crew, my new trail family, was never far away and would often materialize in the evening to cook, camp, and carouse. 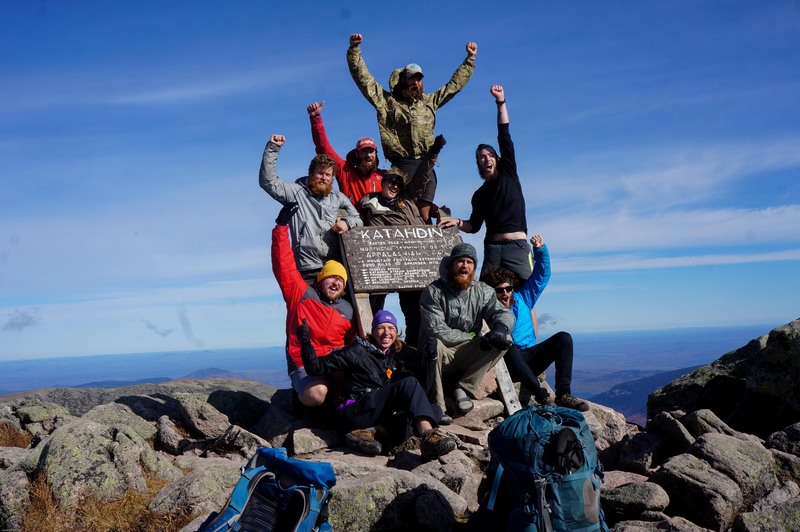 On October 4, 2013, I reached the summit of Mount Katahdin and was immediately greeted by the eight people that had become my crew, my trail family. We were on top of the world! We knew who and what we were. We were thru-hikers! We were confident, we were respected, we were strong, and, as long as we were on the trail, we felt a certain sense of invincibility and solidarity. At that point civilization meant luxury. It meant hot food and grocery stores and soft beds and the family and friends that we’d left behind. We returned to the world we’d left behind and realized and that there was a price to pay for all of the luxuries that we’d been dreaming about. Even though we’d changed, the rest of the world really hadn’t, and most of the uncertainty, chaos, and problems that we’d left behind were still sitting there waiting for us. We thought that we’d have lots of time on the trail to deal with whatever baggage we were dragging behind us, to figure out how we fit into the world, and what we wanted to do with our lives, but it didn’t seem to work out that way (at least for me). We’d been warned about post hike depression, that leaving the trail would be hard, and that we’d have trouble adjusting to civilization. We thought we understood what that meant and that we were prepared for it, but we weren’t. We had been a part of something that was bigger than ourselves and we had changed. We had disconnected ourselves from jobs, our homes, our lives, and the people we loved so that we could follow a dream, hike the trail, and go on an incredible journey. Our new world on the trail had became our everything, and now that it was gone. We were lost at the very moment that we’d expected to be found. We went home but were strangers there because we had changed. The people that were close to us and understood us when we left didn’t understand us anymore because we had changed. Our trail families, the people that understood us now, were far away and having their own struggles as they tried to figure out how to connect to the worlds that they were returning to. It takes time or trauma or both to disconnect from the world as completely as we had, and we hadn’t truly understood how hard it would be and how much time it would take to reconnect to world. It is three months later and it seems like most of us are either still working on reconnecting, or are preparing to disconnect again. On January 9, 2014, just three months after completing his thru-hike of the AT and less than a year after finishing his military service, my friend Shady is dead. Shady was a thru-hiker, a war veteran, and an epic hero. At first glance Shady was just a thru-hiker like the rest of us, a part of our community, and a part of my trail family. As thru-hikers we know that, “You can leave the trail, but the trail never leaves you,” and as a vet, Shady had left the war, but the war hadn’t left him. Hiking with him during the day you wouldn’t know that he’d been an Airborne Ranger in the United States Army and that he had served one tour in Iraq and three tours in Afghanistan as part of United States Iraqi Freedom and Operation Enduring Freedom, respectively. He was kind, generous, and just like we immediately welcomed and accepted him as a part of our family, he immediately welcomed us and accepted us as part of his family. He was a part of our crew, he tried to take care of us and we tried to take care of him. For most of us questions like, “Would you be willing to die to protect your family, your crew, your country” and “would you able kill to protect your country, your crew, and your family?” are purely theoretically. We haven’t been confronted with the harsh reality, sacrifices, and memories that happen when you’ve lived through answers to those questions. Many of our vets, however, have had to face those realities and either live or die with consequences. For them, sacrifice is no longer a romantic notion, it has become a complicated, messy reality. Facing those realities and living through those experiences disconnects them from the world that they are trying to protect. The sacrifices that Shady had made, had been willing to make, and continued to make were not intangible far away things comfortable tucked away in the land of theory. They stalked him on the trail and ambushed him in his sleep. He did not sleep well. At night Shady tried to protect us from foes we couldn’t see and only he could know. When a sharp screech pierced the quiet night sky in the 100 Mile Wilderness, Shady threw himself over the person next to him in the shelter to protect him with his body. He thought that an improvised explosive device was going off, and he was going to save as many of us from it as he could. He didn’t hesitate, he didn’t think about what would happen to him, he just did what he could to protect us. None of us had any doubt that Shady was willing sacrifice himself to protect us. It didn’t matter that what he was actually protecting us from was a personal alarm going off in somebodies pack. It didn’t matter that he’d woken us up at 2 am again. I didn’t matter that it took 10 minutes for him to realize that it was actually his alarm in his pack. It didn’t matter that it took him another 10 minutes to figure out how to shut it off (though I may have kindly suggested that he throw the damn thing into the river after the first five minutes). We loved Shady and he was part of our crew. I wish that we could have protected him the way he tried to protect us. As thru-hikers many of us find it challenging to transition back into the real world and I can only imagine how much harder it must be for our vets. I am glad that I had the opportunity to walk beside Shady and to call him my friend. I admired Shady for his honesty, his strength, his sacrifice, his openness and his sensitivity. He reminded me of one of my childhood heroes, my dad (a Vietnam combat vet). I wish they could have met each other. Knowing Shady and hiking the trail have both helped me to better understand the sacrifices that Shady, my dad, and many of our nations servicemen and servicewomen make. Shady restored my faith in heroes. Not the perfect superheroes of my childhood, but the kind of heroes that I can believe in and embrace as an adult. Heroes that are real, that are human, that are conflicted, and that have risked everything to protect us. Now that I’ve learned to believe in heroes again I am horrified to learn that our heroes are dying… not just out on the battlefield and in foreign lands, but here at home and by their own hands (22 veterans kill themselves each day according to the federal Department of Veterans Affairs). I want to reach out to our veterans, to thank them, and to support them. We need to figure out what we can do to keep our heroes from dying. My condolences to Shady’s family and friends. Memorial services for Shady will be held on January 13, 2014. In lieu of flowers, memorial contributions may be made to the Wounded Warrior Project, P.O. Box 758517, Topeka, Kansas 66675 or to the Appalachian Trail Conservancy, P.O. Box 807, Harpers Ferry, West Virginia 25425. Update: The Silence: More thoughts about Shady, Combat Vets, and PTSD. If you are thinking about suicide and have trouble reaching out consider reading this article.